Thanks for taking the time to visit George's website. 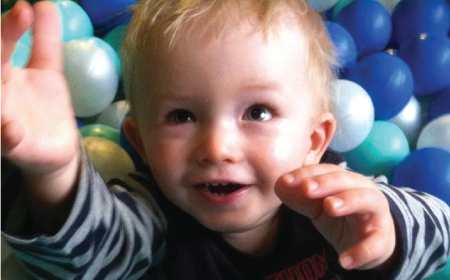 Despite being diagnosed with the devastating muscle wasting disease SMA type 2 little George is a bundle of Inner strength. George may be frustrated that he can't reach for his favourite toy, chase his big sister Evie or simply stand like any other toddler would, when everyone around him is heartbroken that he will face a lifetime of challenges little George knows no different when he tells his big sister off for overstepping the mark, cuddles mummy and daddy like a teddy bear and giggles just like any other child. Help us keep Georges inner strength by allowing him the same chances other toddlers have by raising money for a very special Snap Dragon Wheel Chair. Spinal Muscular Atrophy is an inherited neuromuscular condition which affects 1 in 6,000-10,000 babies born every year. Visite George's JustGIving page to pledge a donation towards his cause, any amount will make a big difference! © 2012. George's Rainbow Fund. All rights reserved.